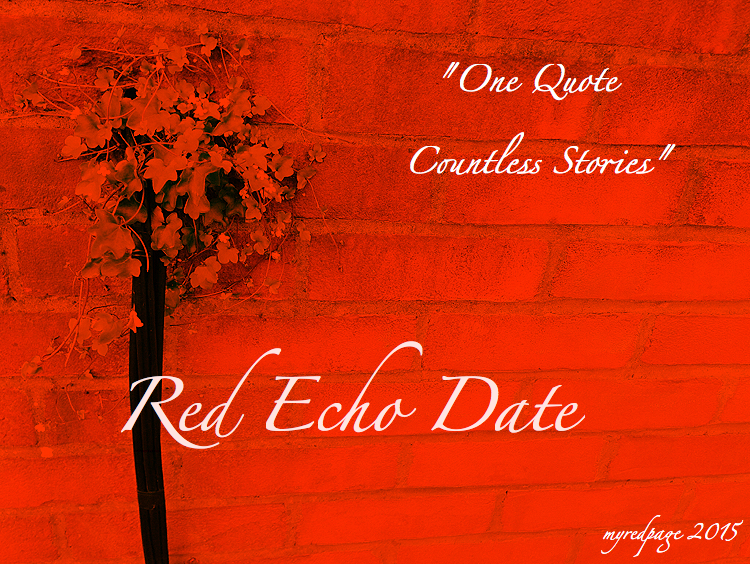 I wanted to start this week’s R.E.D post by extending a huge thank you to all of you who’ve been absolutely amazing…supporting the launch of ‘One quote…endless stories’! Your feedback and encouragement means the world to me and I hope more of you will feel inspired and join our quote challenge. This week’s echo…tell us your own take on it! Did you ever think about were you are right now? I ask myself constantly…what do I really want and if one day I will achieve it, will I know? I guess life will always be a long journey to destination we sometimes know or we will be surprised by it when we’ll get there! The moment we live right now, should be the only one on our mind…so stop thinking about what once was or what one day will be and be sure you’re not missing anything NOW! …the biggest regret we can have is that we are to overwhelmed with things we cannot change anymore or too tangled in what we could change for the future and miss the opportunities life is offering us today. Those little moments that mean so much…memories we could never recreate again…don’t let them pass you by…live your life in the present! What if your only chance is now? Let the past be behind you and stop worrying about things that didn’t happen yet! …you might miss a chance of a lifetime. Carpe diem is not just an ancient expression…it’s the core ingredient to our journey. From my previous R.E.D posts I have to share with you one entry that is pure inspiration and that belongs to MasterSelfTherapy. Please take a moment and read this post…these are the moments when I feel that what I do truly makes a difference! Thank you all for your support and hope to read your words of wisdom soon! I love your posts and photo’s, and that is why I nominated you for the creative bloggers award! I appreciate the nomination…give me a bit of time and I will create a post for it! You’re welcome 🙂 I would appreciate that, no need to hurry! I am happy you found it inspirational because I really enjoyed reading your post! I found the quote a bit different and very inspirational!